I may have rolled my eyes once or twice when Amelia told me last October that she wanted to participate in Peewee Cheering. I admit it. She had the flyer in her hands and she read it to me (why’d we have to go and teach her that trick, anyway?) and said she really wanted to try it. 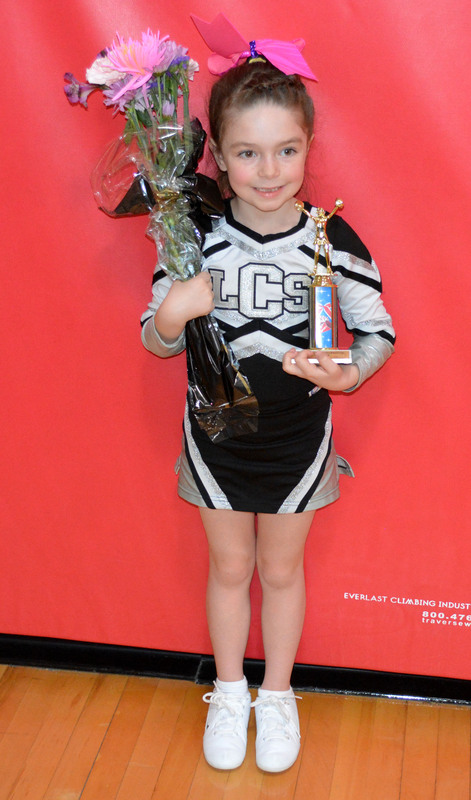 We’ve seen several cheering competitions and she loved the idea of performing in front of people. 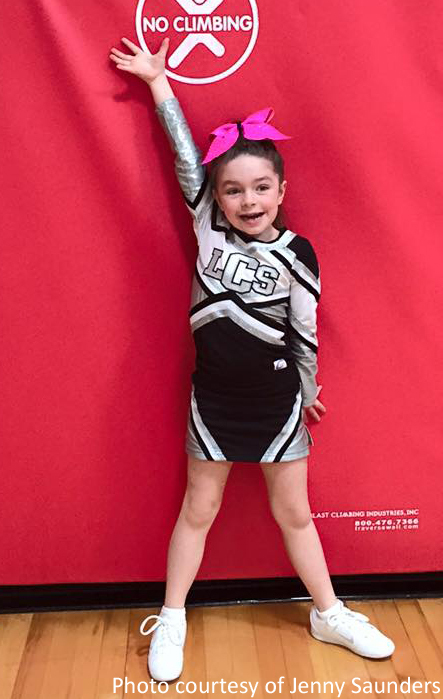 I have no idea where she got that flair for performing, but we’re supposed to nurture and encourage our children so I signed her up and swallowed my reservations about cheering in general. They started in mid-November learning arm positions and general movement. Our team has girls from Kindergarten through Fifth grades, so there’s a wide range of ages and physical capabilities, especially at first. As the weeks went by, they learned a cheer and started working on a dance routine. Those were tricky for Amelia…lots of memorization and moves she hadn’t quite mastered, but she charged ahead with determination and enthusiasm. And then in January, the entire routine rapidly started coming together…in bits and pieces at first and then more…jumps, transitions, stunts. With each practice she gained confidence and skill. It really has been a joy to watch. This past Saturday they not only performed in front of people besides their parents but competed in a competition for the first time. I can’t tell you how proud I am of her. She was really nervous. The whole week prior she had commented on how scared and excited she was to perform. They had several practices during the week, plus she practiced at home. She was up at 5:30 a.m. Saturday morning too excited to sleep any more. I was pretty excited for her too. There were two rounds, the first was an unscored safety round and the second was the one that counted. The latter is below. I annotated the video to point out Amelia occasionally since it’s sometimes hard to keep track of the girls. They did a great job. They got the Third place trophy for their division and were pretty psyched about it. They have some work to do this week in preparation of this coming Saturday’s State Cheering Competition in Bangor. I’m just so proud of her…her courage, determination and dedication. For a six year old, she’s put in a lot of time (all the girls have). We’ve had a couple rough weeks with a tired girl. But, she’s plowed through to make it work. You can hear me say in the video as her name is announced that her flair for drama has come in handy. What do you think?